« March 7, 2018 Meet Lesley, Crops are Thriving, Farm Store Expansion, Garden Show…oh my! Shrek and Chris began the field work this week in the perennial flower seed crop production field. It is a production field, but I like to call it the production garden because the flower seed crops are so beautiful when they are all blooming it looks like a giant garden! Anyway, there are several crops that are being removed because Jelitto, the seed company we contract grow these plants for, doesn’t need any more seed from those varieties for a while. 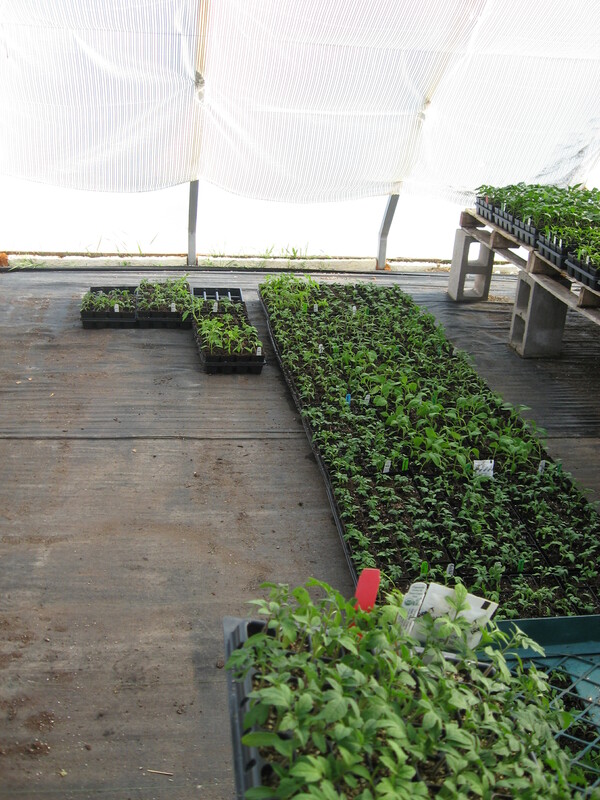 We have loads of new seed crops waiting in the greenhouse to be field planted starting in early April once the field prep work is finished. 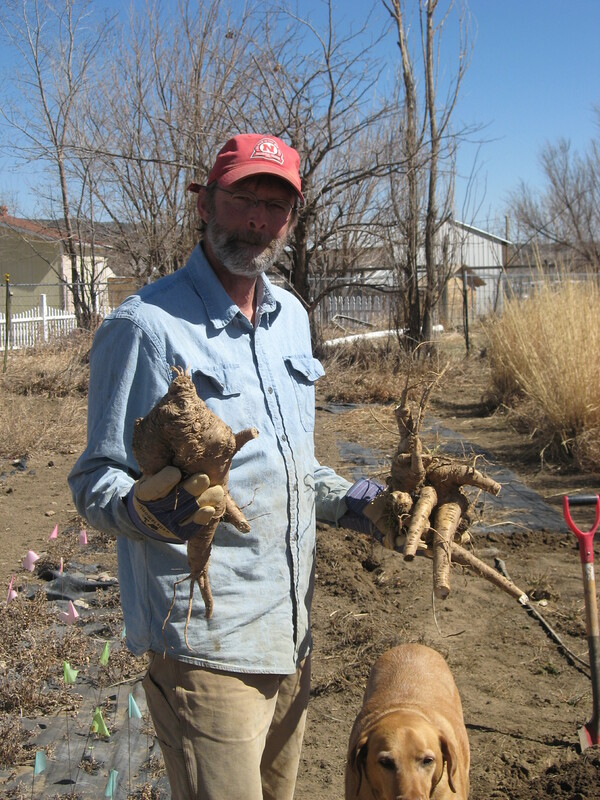 These massive roots Chris is digging are Callirhoe involucrata tenuissima. They must be removed before we plant the new crop of traditional Callirhoe involucrata (commonly called Poppy Wine Cups). This is important so that cross-pollination doesn’t occur between the two varieties. 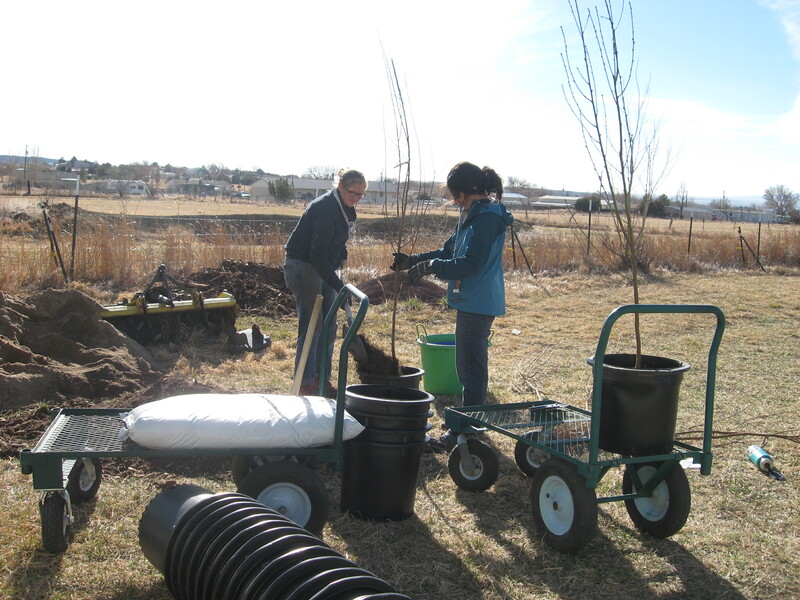 The women planted the bare root heirloom stone varieties of fruit trees this week. Stone fruits are fruits like peaches, apricots, nectarines, plums and so on that have a pit in the center which houses the actual seed. These trees will be grown on our farm now for a full year before we sell them next spring in our Farm Stand store. 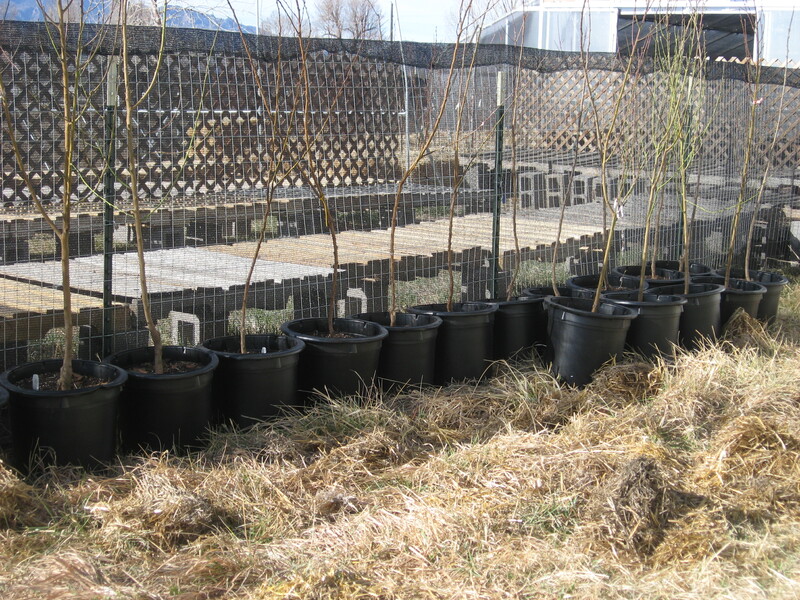 The heirloom fruit trees that we planted last spring will be available in the Farm Stand store this spring. Lizz and I started organizing them in the nursery on Wednesday and there are a lot of them! The trees above will be our 2019 spring heirloom fruit trees to sell. I spent half of my day today transplanting the first tiny tomato crop into 2.5″ pots. 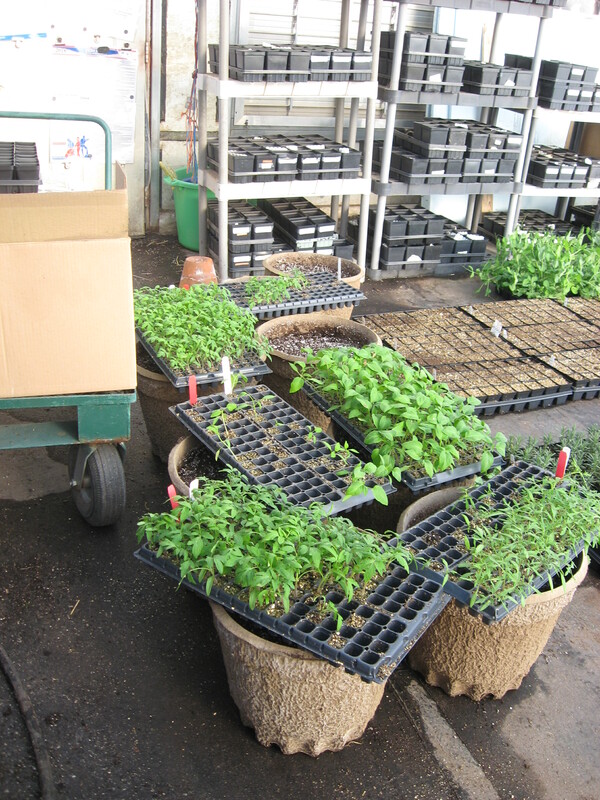 These will be the first tomato plants ready when our Farm Stand store opens on April 14th and also for our wholesale customers who are eager to start getting a few varieties of tomatoes in stock. The main tomato crop will be sown next week so that it will be ready at the end of April and first part of May. Tomatoes grow fast, so we don’t have to give them as much lead time as we do for herbs, perennials and many of the other varieties we grow. I got half of them planted today and tomorrow after I finish watering the greenhouses (which takes half a day now to complete EVERY SINGLE DAY – thank goodness for good music and a set of headphones! ), I’ll finish planting the rest of this tomato crop. Chris and I eat fruit, yogurt, nuts and of course a sprinkling of bitter chocolate chips nearly every morning for breakfast. If I run out of fresh fruit we use the frozen fruit I picked in the garden last summer. 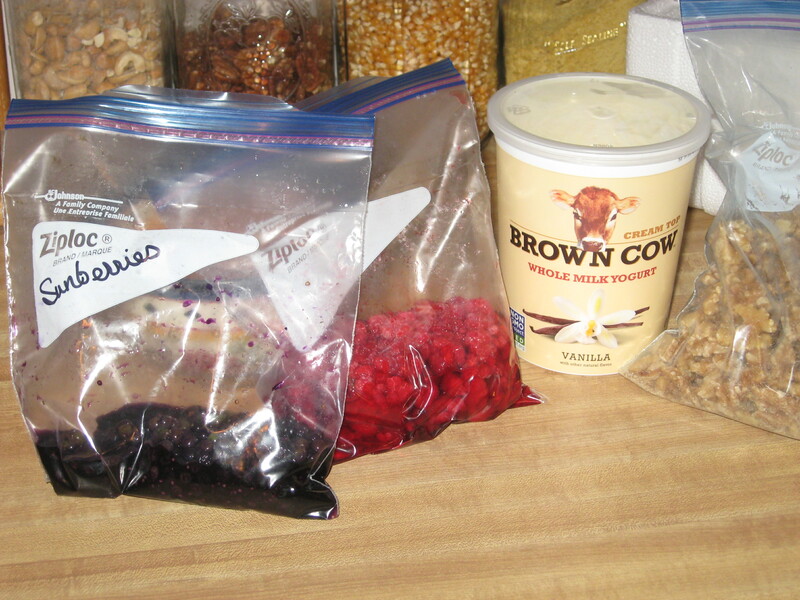 We’ve nearly used up all our frozen fruit supply, but there are still a few bags left in the freezer. Today, we had frozen sunberries and raspberries from the garden last year. Sunberries are incredible! They are tiny and blue and taste a lot like blueberries when used in cobblers, pies or in yogurt breakfasts! Raspberries continue to be my most favorite fruit in the whole world and so I can never have too many raspberries! You should grow some sunberries in your garden or in a container pot this summer. They produce a big harvest and I know you will love them!! Now that we are working 12-15 hour farm days, it is all the more important that we start each day out by stretching and getting limbered up for all the physical work that is required each day. 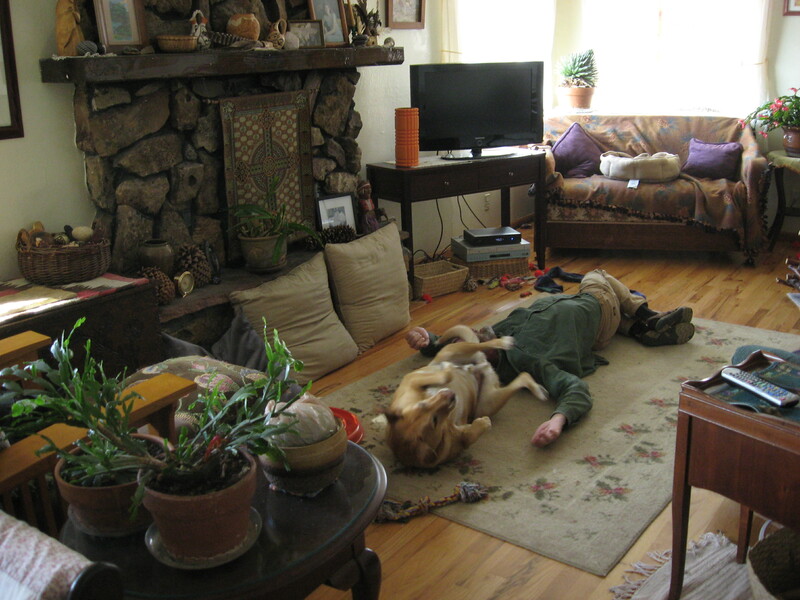 As you can see…Shrek takes this very seriously and never misses a stretching session!